Could Brett Favre become this generation’s George Blanda? What would an NFL season be without a good Brett Favre rumor? Was this an innocent comment? Was it one meant to plant the seed in the minds of NFL fans across the country? Or, was it a calculated statement by Cook to generate some buzz and see what interest there might be from NFL teams looking to upgrade their quarterback play. I’ll let you decide which of these questions makes the most sense to you. But for the record, how have 44-year-old (or older) quarterbacks done in the NFL? A quick scan of the files and we see that four different players have tossed a pass or two at age 44 or older. Here’s a brief look at this quartet. George Blanda: The poster child for aging quarterbacks in the NFL. Blanda, who also doubled as a Hall of Fame placekicker, played in the NFL from 1949-75, scoring 2,002. From age 44 until his retirement in January, 1976 at age 48, Blanda threw 80 passes for the Raiders, completing 39 of them. He threw six TD passes after the age of 44. He is the oldest player to make a pass attempt and have a pass completion in NFL history. He completed one pass in three attempts in a game on December 21, 1975 at age 48. Steve DeBerg: DeBerg played in seven games as QB for the Atlanta Falcons in 1998 at age 44. He completed 30 of 59 passes with three TDs and one interception. Warren Moon: Eight days after his 44th birthday, the Hall of Famer started at QB for the Kansas Chiefs versus the San Diego Chargers. The result was not a good one. The Chiefs lost 17-16. Moon completed only 12 of 31 passes for 130 yards and had one interception. It was his last career game. Vinny Testaverde: Barely a month after turning 44, Testaverde got the start in three games for the Carolina Panthers in 2007. In those three games he completed 49 or 91 passes with four touchdowns and five interceptions. 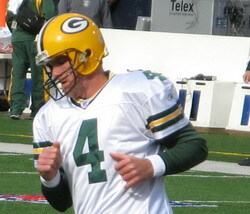 He played his last NFL game on December 30, 2007. Will Favre join the above list?